BOSTON, MA -- Another week in the books in the Eastern Hockey League Premier (EHLP), and this past Saturday and Sunday saw many great matchups and performances from all across the league. 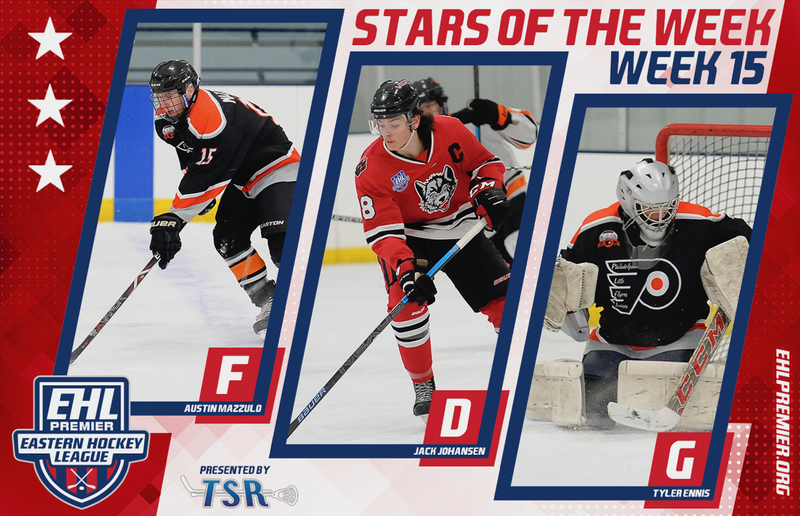 The next set of TSR Hockey Stars of the Week will be released on Monday, January 28th. Remember to catch the #Eshow all season long on HockeyTV. Yingling and the Panthers swept their weekend series with the Philadelphia Jr. Flyers, pushing their way up to 4th place in the Mid-Atlantic Conference standings. The leading scorer in the EHLP did just that this past weekend, scoring six goals while dishing out five assists. For the season, the 2001-born native of Harrisburg, PA now has 98 points through 30 total games. Yingling has only been held off the scoresheet once so far this year, and he's especially hot as of late, with 22 points in his last four contests. We flip over to the New England Conference for our final pair of honorees, as Bepko and the Chiefs won both of their games this past weekend. The 2000-born native of Newtown, CT scored the overtime winner on Saturday against the Valley Jr. Warriors, and then added a pair of assists in his team's shootout win over the Boston Jr. Rangers on Sunday. For the season Bepko now has eight goals and three assists through his first 28 games with the Chiefs. While Briggs was only between the pipes for one of the two victories, he made it count, turning in a 44-save performance against the Boston Jr. Rangers. With the win, the '99 native of Foster, RI improved his record up to 9-10-1 for the season. The victory also snapped the second skid that Briggs has endured during the season, so he's hoping the pattern will shift back to they way it was from mid-October to mid-November when he won six straight contests. Looking ahead, the Chiefs will lean on Briggs with seven of their next eight games coming on the road. Following that stretch however, the Connecticut will then close out the season with seven straight games in the friendly home confines of Newington Arena. 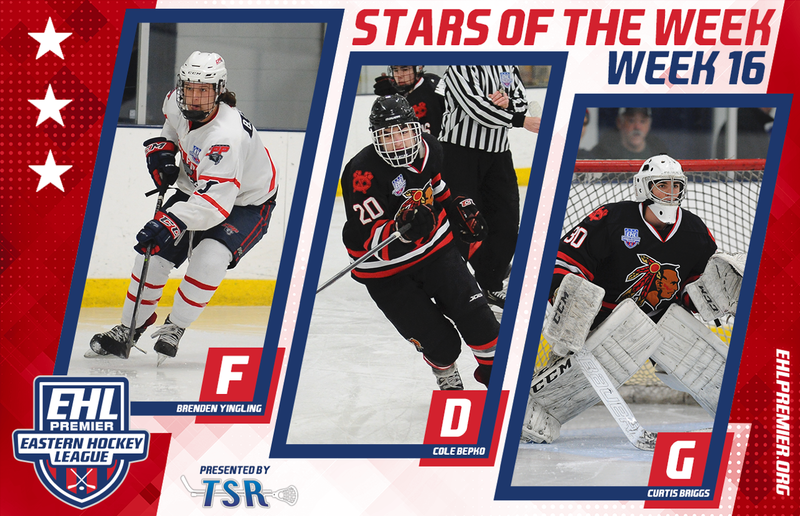 This is the 3rd time this season that Briggs has been named the Goalie of the Week in the EHLP (TSR Hockey Stars of the Week #3 -- TSR Hockey Stars of the Week #9). Wrapping things up this week, the EHLP would like to recognize Nick Bouchard of the Philadelphia Little Flyers with an honorable mention. The 2000-born forward from Hockessin, DE scored a pair of goals in his team's road victory over the New Jersey Renegades on Saturday, and then gave the Little Flyers the home-and-home sweep with the shootout winner on Sunday. For the year, Bouchard now has an even ten goals and ten assists in 28 total games to date.